Many a times we come across a scenario where we need to execute some code based on whether a Stored Procedure exists or not. 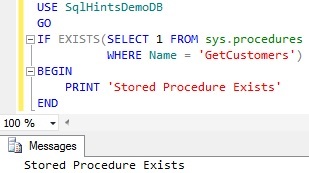 There are different ways of identifying the Stored Procedure existence in Sql Server, in this article will list out the commonly used approaches. Let me know which approach you use and reason for the same. We can write a query like below to check if a GetCustomers Stored Procedure exists in the current database in any schema. 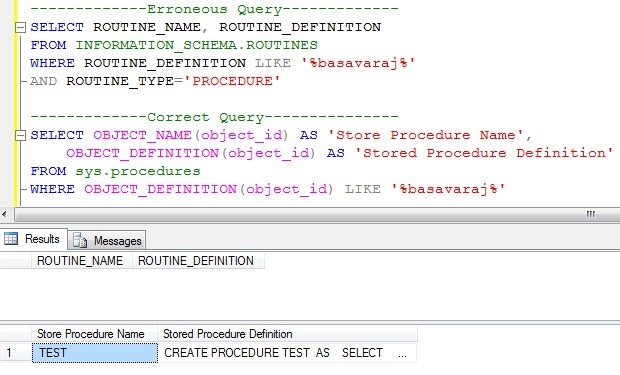 If you are looking for only Sql Stored Procedure, then in sys.procedures catalog views query you can add the filter AND condition as: Type = N’P’. sys.procedures catalog view inherits the rows from the sys.objects catalog view, sys.objects catalog view is referred to as base view where as sys.procedures is referred to as derived view. sys.procedures will return the rows only for the stored procedures whereas sys.objects view apart from returning the rows for stored procedures, it returns rows for the objects like: tables, views etc. We can use OBJECT_ID() function like below to check if a GetCustomers Stored procedure exists in the current database. Specifying the Database Name and Schema Name parts for the Stored Procedure Name is optional. But specifying Database Name and Schema Name provides an option to check the existence of the stored procedure in the specified database and within a specified schema, instead of checking in the current database across all the schemas. The below query shows that, even though the current database is MASTER database, we can check the existence of the GetCustomers stored procedure in the dbo schema in the SqlHintsDemoDB database. We should avoid using sys.sysobjects System Table directly, direct access to it will be deprecated in some future versions of the Sql Server. As per Microsoft BOL link, Microsoft is suggesting to use the catalog views sys.objects/sys.procedures/sys.sql_modules instead of sys.sysobjects system table directly to check the existence of the stored procedure. How to find all the Stored Procedures having a given text in it? As usual tried to understand the query and thought of checking it’s correctness. And to my surprise when I checked this view’s definition using: sp_helptext ‘INFORMATION_SCHEMA.ROUTINES’, the ROUTINE_DEFINITION column was returning only the first 4000 characters of the Stored Procedure definition i.e. in view ROUTINE_DEFINITION column is defined as: convert(nvarchar(4000),object_definition(o.object_id))AS ROUTINE_DEFINITION. So with this it is clear that it will not return all the Stored Procedure’s which have the first occurrence of the search sting in its definition after 4000 characters. There are multiple alternative way’s with which we can correctly find all the Stored Procedure’s having a given text. And sys.procedures explained in this article is one such solution.